What are the bases that you are going to choose when you are thinking of recruiting a new employee for your company? We have a solution to your problem. The aptitude testing is the answer. The aptitude test is becoming very famous these days and many business companies are using this for their recruitment process, which helps them to have a better overall evaluation of candidate’s and also their suitability for the job that they will be applying for. They simply make the hiring process more successful. As mentioned above, the aptitude tests which are taken by the company helps them to recruit the employee with the required calibre. These kinds of tests can be a good option for selecting the candidate. By this, the organization will be able to calculate the candidate future potential by having numerical reasoning, logical reasoning, and analysis section in the tests. They can totally check if the candidate is able to perform well even in the areas which are out of this comfort zone. This gives a clearer insight into the person. These are the tests which are there to test the employee understanding about the written texts and what kind of conclusion he can draw from the given written context. No matter what industry is going for the recruitment, the verbal test helps in the recruitment of the employees in a better way as the employer will get to know the thinking ability of the candidate by the choice he is going to make in these tests. To get the information about a candidate’s general numerical aptitude, these standardized psychometric assessments are used by the organization while hiring the candidates. These tests are designed in such a way that it will gauge the candidates’ ability to go for the correct decisions or inferences when provided with the numerical or statistical data. It is done to make sure that the candidate is best fitted in the realistic workplace context. They are the standardized psychometric assessment tests that help an organization in gathering the information about a candidate’s general ability when given a situation to manage and respond to a series of different tasks, to negotiate the coming conflicting demands or analyse different priorities. Both these tests followed the fiction business scenarios which help in judging the candidates’ response to it. The main difference between these tests is that in E-Tray, the variant is presented on a computer and the responses are entered on-screen. While in the In-Tray exercise, it is based on a series of paper-based materials. These kinds of tests can be used for recruitment process or at any stage and even as a group exercise. If the organization wants to check for the candidates’ ability and competency with mechanical concepts, this type of tests are being taken. Talking about the broader way, these kinds of test are done for the technical and engineering job positions usually. They include mechanical and engineering concepts and the questions which are related to them. The level of the tests is based on the position you are recruiting for. You can increase the difficulty level within the same time constraint. 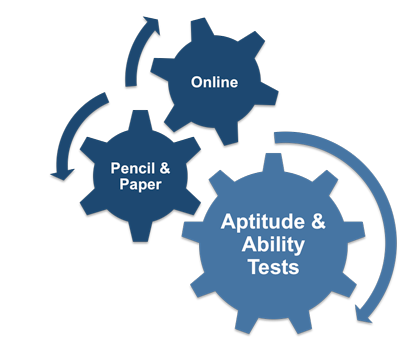 They are the standardized psychometric assessment tests which are usually used when the job applications come up. These tests help the organization to know more about the candidate’s ability to solve problems. They are helpful in knowing the ability of the candidate to work flexibly when given the unfamiliar information and then find solutions. The people who score well in these tests generally have a greater capacity to think conceptually and analytically as well. This test is usually done to check the candidate’s ability to do the basic numerical problems in no time. The basic numeracy is being checked and this kind of test can be categorized as a speed test also. If an organization wants the information about a candidate’s general vocabulary size, these kinds of tests are done by the company. This could be the biggest question in the minds of the people but we have a complete and satisfying answer for that. These tests will help the organization to look for the candidates who can showcase their personalities, use their own skills, abilities, and knowledge. Another fact that is needed to be considered and also important is that the candidate who is coming to the company is also able to look forward to the betterment of the company in the right manner. With different types of aptitude tests, you will be able to get all the valuable information about the new candidate and get to know all the behavioural and skills part of the person. Not only this, but it is also cost-efficient. You need to hire a good person for the company and with these tests; you can totally rely upon the results. Indeed a personal interview is equally important as it can be a measure to see the confidence level of the person, so along with that, these tests also help you to find the best-suited guys for the job. Another benefit of using these tests is that, with the upcoming large opportunities for the job, there will be a large pool of applications as well. So it makes it hard to look for the deserving candidates. Hence, by using these tests, you will be able to filter out the most deserving candidates which are the right choice for the type of profile you are looking for. This reduces the risk of the hiring of the wrong candidates due to the accuracy of the results. After all, to build a great business, great people are needed within the organization.